Katie Schneebeck has always dreamed of working with Olympic athletes. As a student in SLU’s athletic training program, she’s on her way to doing just that. 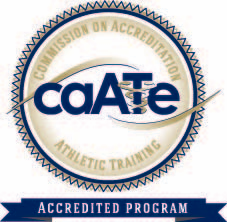 The athletic training program at SLU is a five-year program, accredited by the Commission for Accreditation of Athletic Training Education (CAATE), which is in charge of curriculum and accreditation across the nation. SLU’s program, housed in the Doisy College of Health Sciences, became accredited in 2010, making it one of more than 350 programs recognized by the CAATE. However, it is just one of 27 programs defined as an entry-level master’s program. Now in her second year of the two-year professional program, Schneebeck was accepted to the program after earning a degree in integrative physiology from the University of Colorado. She has held internships at Washington University in St. Louis and NutriFormance, and is currently at Affton High School. Working with patients young and old has given her “a whole new perspective on rehabilitation at every age,” Schneebeck said. “What’s very unique about the way athletic training educates its students is that you are in clinicals at the same time you are in class. Our students are experiencing things in the afternoon that they may be talking about in class the next morning,” program director Tony Breitbach said. Faculty and students work together to customize the program to each individual, tailoring it to where they envision themselves working when they graduate. “For example, [Schneebeck] wanted to be somewhere smaller, where she could take on a lot of responsibility,” Breitbach said. The program is professional in nature, building clinical principles on a liberal arts education. It is designed so that students can enter as freshmen and complete the program in five years. After their third year, they enter the professional phase of the program. Students can earn a Bachelor of Science in exercise science after their fourth year of studies. Upon completing the fifth and final year of study, students are awarded the Master of Athletic Training. While mostly made up of freshmen who are directly admitted into the program, transfer students already holding a degree may apply for the professional phase of the program. Mark Reinking, the physical therapy program director, began the athletic training program as a project for his doctoral thesis. The goal of the program is to train students to become competent practitioners by educating them in the classroom and providing them unique clinical experiences. “Having athletic training in a Jesuit university is a great fit. It’s a service-oriented profession,” Breitbach said. The program has graduated 16 students to date, but will graduate its first class of 15 students who entered the program as freshmen this spring. “We can’t just leave our kids at the high schools with no help…there needs to be somebody there taking care of these kids in high school, especially as there is more awareness about the danger of concussions,” Breitbach said. In addition to this traditional setting, new niches have also developed for athletic trainers in the entertainment industry and in industrial settings. “The newest places athletic trainers have been seen is within the entertainment industry, ballet, the Blue Man Group, and on tours with major performers,” Schneebeck said. “One of our graduates works for Boeing in Washington, which is actually the largest employer of athletic trainers in Washington,” Breitbach said, highlighting the need for athletic trainers in the industrial setting as companies realize they lose less time and have less injuries by hiring these professionals. Finally, as the United States continues to experience increasing health care costs, athletic trainers have been called upon as “physician extenders,” bringing their unique set of skills into the orthopedic setting. “Athletic trainers are very good at managing injuries in time frames they don’t choose. If somebody gets injured on Wednesday night, they’re going to want to play Saturday,” Breitbach said. This ability to wear multiple hats makes athletic trainers well equipped to assist physicians in the multiple roles often needed during procedures. “Our classes provide a ton of hands on learning,” Schneebeck said. SLU’s program looks to prepare students for this vast and changing landscape by exposing them to clinical rotations throughout the professional phase of their program as well as hands-on in-class experience. “We have a clinical simulation lab with mannequins that bleed, blink, their eyes dilate, and they have a pulse,” Schneebeck said. “It takes a different kind of person to succeed in this niche. Often many athletic training careers require a great deal of time commitment. Some get burnout and some really shine in this profession,” Breitbach said. The Athletic Training program is a unique and burgeoning program, still evolving to meet the needs of an ever-expanding healthcare industry. Most importantly, the program is a bastion of the Jesuits’ commitment to service. “I want to take part in the government side of athletic training and use my experience with Invisible Children to enhance my ability to positively affect those around me,” Schneebeck said.